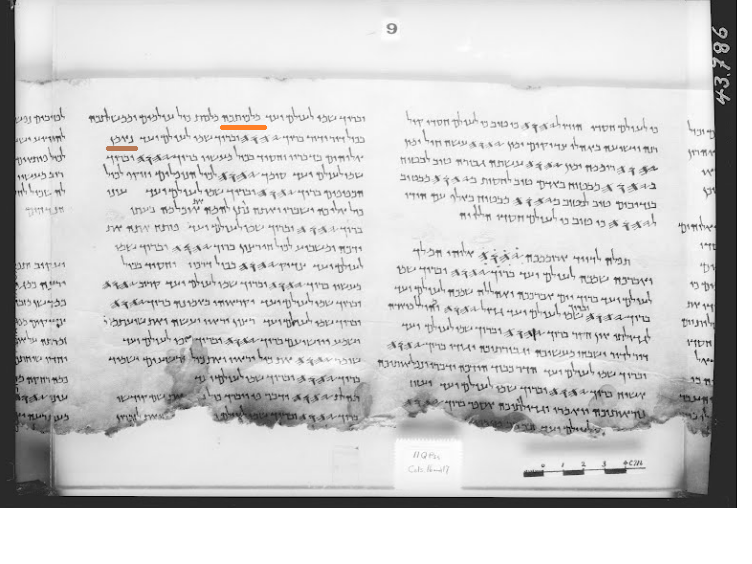 I understand the textual evidence somewhat for 13b in the Syriac, LXX and Qumran, but I find it a bit incredulous that a scribe would accidentally make such an obvious deletion and that it would continue to be copied that way thereafter. Is 13b (i.e. the line beginning with nûn) a deletion from the MT or an insertion in other families? And if it is an insertion, what is the significance of leaving out the one letter? It is true that all Jewish prayerbooks and scriptural resources exclude a "nun" line in Psalm 145. It is also true that the Septuagint, the Greek translation of the Bible read by Greek-speaking Jews and Christians, the Peshitta – the translation used by the Syrian church, and one of the Dead Sea Scrolls’ Psalms texts, presumably used by members of the Jewish sect of Essenes, all include a line that reads, "Trustworthy (neeman) is the Lord in all his words, and righteous is he in all his ways." But it is not clear whether those versions retain a line that had been dropped, or whether the verse is an interpolation. It is speculated that, at one point, some scribe was bothered by the "imperfection" of this psalm and composed this line in order to fill in the glaring gap in the text. The Mishna-era sage, Rabbi Yochanan (died about 279 CE), is quoted in the Babylonian Talmud, Tractate B'rachot 4b, stated that King David's original version had a verse beginning with a nun, stands for the word "nefilah," which means "falling." This word root has a negative connotation, since it is used regarding the fall of the Jewish people, as it is written, "She [the Jewish people] has fallen (nuf'lah), no longer will the maiden of Israel stand again" (Amos 5:2). Therefore King David did not include this letter when writing Psalm 145. Nevertheless, King David did include a positive-connotation "nun" in the following verse, which reads: "The Almighty supports all the fallen ones (ha-noflim)..."
Is there a Hebrew manuscript basis to include the missing "Nun" verse between Psalms 145:13 and Psalms 145:14? As in the Masoretic text, A "Nun" phrase does not appear in the Aleppo Codex, Western Leningrad Codex, or the Biblia Hebraica Stuttgartensia (BHS). However, a "Nun" phrase IS present in the Dead Sea Scrolls, 11Q5 Psalms a, (Plate 9 Link). Wikipedia Translation - Faithful is YHVH in all His ways, and merciful in all His works. Note 1: נאמן is the last word, (on the left), of the Left-Hand Column, 2nd Line Down. Note 2: Left hand column, second row, third word from the right ends the traditional v. 13, "בכל־דור ודור". Note 3: Also note that the Paleo-Hebrew text does not start a new line for each letter. Qumran Psalms Scroll (11Q5/11QPs-a) - Significance - Sanders has argued since its original publication that 11QPsa represents a true "canonical" Psalter that gives witness to the "fluid" and "open ended" character of the last third of the book of Psalms before the first century CE. This proposal raises two primary questions that highlight the significance of 11QPsa. However, in this manuscript, chapter 145 follows 136 > catena > 145, (See Notes on 11Q5 Contents and Structure: Link). Although the Dead Sea Scroll is a much earlier artifact - it is not conclusive evidence the verse was later omitted by mistake. Further - the Dead Sea Scroll text is absent clear structure, and can be proof that there was no intent to preserve alphabetic structure. Psalms 25 - Missing: "Bet", (verse 2B); "Vav", (verse 5b) ... "Qof" ... Psalms 34, etc. This verse is quoted in the Apostolic Constitutions,1 but is referenced as Ps. 145:17 in the scripture index. Although the writer is specifically speaking of the faithfulness of the words of Jesus and not the faithfulness of all his works as in v. 17. By quoting this verse, the unknown author of the Constitutions shows that the verse was known in at least the manuscript family they were using. 2Perhaps it was an early Messianic Psalm/verse known by the Jewish disciples of Jesus. The 14th letter of the Hebrew alphabet is considered to represent the humility of Moses, David, and the Messiah. Joshua was the son of Nun (נ noon, the 14th letter of the Hebrew alphabet). Not the answer you're looking for? Browse other questions tagged psalms textual-criticism masoretic-text or ask your own question. Why is there an “extra” verse at the end of Psalms 25 and 34? How many times does the Hebrew word הֵילֵל (heilel) occur in the Masoretic text? When was the Hebrew Bible's exact text/spelling synchronized globally? Are any unvocalized versions of the Masoretic Text available, online or otherwise?